Has this feedback begun to change the face of German business also? Hänsch: Yes. But it is still much more difficult than it would be in the US, simply because there are practically no venture capitalists here. We are probably just not adventurous enough. In Germany, if you make a single mistake, you are written off. A failure in Silicon Valley tends increase interest in one’s next venture, because everyone assumes that if you start over again, you must have learned from your mistakes. A young man named Steve Jobs attended your lectures in Stanford. Is it true that he invited you to visit his famous garage in Mountain View, in which the first Apple computer was built? Hänsch: Yes. We also tested the first prototypes. We bought an Apple I in the Byte Store there. That was one of the many computer kits for hobbyists that were on the market then. I went there regularly to see what was new. And I was there when Steve Jobs and Steve Wozniak tried to persuade the owners of the Byte Store to sell the ready-made, i.e. completely assembled, computer they had put together. All the user had to do was to connect it up to a TV set and a keyboard, and it was ready to go. Hänsch: No. It was so frustrating! It couldn‘t even calculate with floating-point numbers, only with integer numbers. So I told Steve Jobs that his computer was not very impressive. And he went back to his garage and personally soldered in an extra memory chip. Unfortunately, I no longer have that Apple I Computer. It would be worth a lot of money today. Did you realize at the time that Apple would be such a roaring success? Hänsch: Apple was just one of hundreds of firms that were getting started then. But there were some indications that Apple might go places. Steve Jobs was a visionary, and he understood that desk-top computers would be useful for virtually everybody. Jobs very quickly began to negotiate with investors. Before his first meeting with bankers, he wore his hair long, like a hippie – and he asked me where he could get a good haircut. Did you ever consider going into computer development yourself? Hänsch: Yes. In fact, I had set up a software company together with Art Schawlow. I had written a program in Basic, more or less for my own use, which could be used to plot functions. At that time, monitors that could display graphics were practically nonexistent. So we put ads in microcomputer magazines and sold the software by mail order – for $90. We earned a few hundred thousand dollars with that program. So the software worked well. Hänsch: We could have had even more success with it, but I only dabbled with it on the side. If I had suggested at the time that we should start a company to develop and market graphics software -- who knows, maybe we would now be like Adobe. Throughout your professional career, you have been involved in training young colleagues. What sort of support could young scientists expect when you embarked on a career in research? Hänsch: When I was a student, there weren’t that many exams, and most of the time one was left alone and could choose the things that were really interesting. Nowadays, students are caught up in a fixed program, and that is probably better for the majority who will find jobs in industry. I try, on the other hand, to give our doctoral students, who have decided to make a career in physics, lots of freedom. They have the feeling that they are working on ideas of their own, and there is no greater motivation than that. Meanwhile, over 50 of my doctoral students and post-docs are themselves professors at various universities around the world. How do you pass your knowledge and ideas on? Hänsch: I don’t really do so consciously at all. Of course, we think over the sorts of interesting projects we might tackle, and what it would be fun to do next. And if I think something might be fun, hopefully others will agree. In daily conversations and in many rounds of discussions and reflection, something finally comes up. Do you impart to your young colleagues any particular philosophy or attitude to science? Hänsch: Yes, I do. What is perhaps most important is a child-like readiness to be captivated, a delight in playing around with problems and teasing out solutions. Many successful scientists have retained something of this instinct for play. And I haven’t yet lost it. I have a well-equipped laboratory which allows me to improvise quickly. It’s my workshop, if you will. Whenever I have an idea I can put something together within a few hours or days which will allow me to get some initial answers, and over the years I’ve found this approach very useful. I can’t call myself a physicist unless I can work in the lab. And the Nobel Prize hasn’t changed that? Hänsch: If I wished, I could spend all my time jetting around the world. But I have to take the time, I have to set priorities. If I want to do science, I simply can’t accept every invitation I get. Prof. Dr. Theodor W. Hänsch holds the Carl Friedrich von Siemens Chair in Experimental Physics at LMU and is a Director of the Max Planck Institute for Quantum Optics in Garching. He also heads a joint research group in the fields of laser spectroscopy and quantum physics. In 2005 Hänsch won the Nobel Prize in Physics for his contributions to laser spectroscopy. 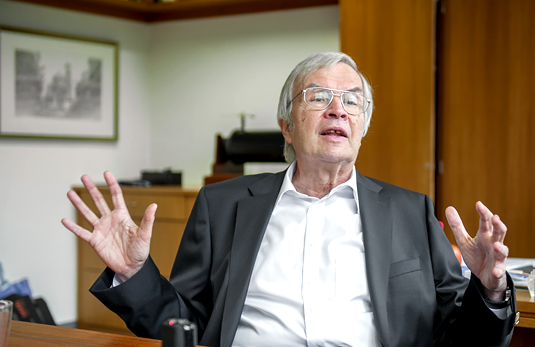 In honor of Theodor Hänsch‘s 75th birthday, LMU, the Faculty of Physics at LMU and the Max Planck Institute for Quantum Optics will hold a symposium on the topic From Laser Physics to Quantum Optics on November 18th and 19th, 2016.